Home > Meet the Doctors > Elena Salerno, M.D. Dr. Salerno was born and grew up on the coast of Northern Italy. She received her medical degree from the University of Genoa where she completed her post graduate training in Obstetrics and Gynecology. Near the completion of her residency she was awarded a three year scholarship at the University of Texas Health Science Center in San Antonio, Texas. There she was involved in clinical research, participating in the Women’s Health Initiative, a large multi-center trial which evaluated the use of hormonal replacement therapy in menopause. She was also involved in basic science research investigating the effects of various drugs on osteoporosis. During her time in Texas she met her husband and they both moved to Louisville in 1992. She then completed her residency in Obstetrics and Gynecology at Baylor College of Medicine in Houston, Texas. She joined All Women OB/GYN in 1999. 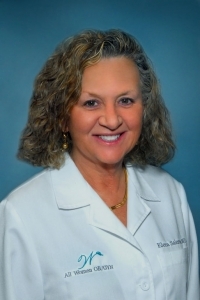 Dr. Salerno is Board Certified by the American Board of OB/GYN in Obstetrics and Gynecology. She is a fellow of the American Board of Obstetrics and Gynecology. She is also a member of the Greater Louisville Medical Society and the Kentucky Medical Association. She has published more than 10 articles in major American Medical Journals on these topics.